Hey Crafty Friends! Can you believe I’m back with another share so soon!? Don’t get used to it…haha. I’m trying very hard to get back to posting more frequently. The little one has stopped napping, and it has taken me some getting used to to find a posting schedule again. 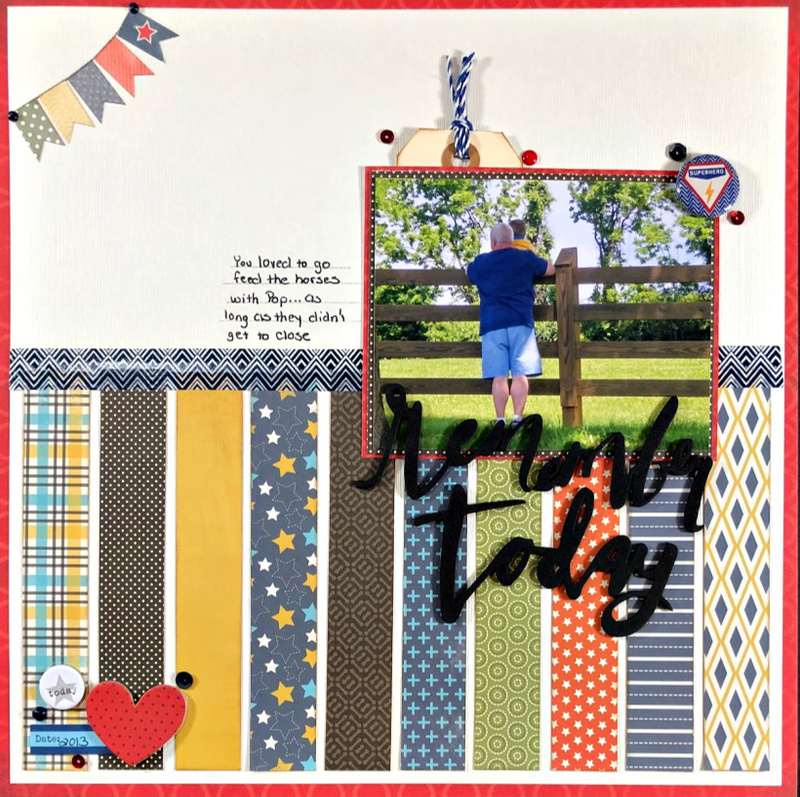 This time I’m sharing a layout with you for Southern Girls Challenge Blog. 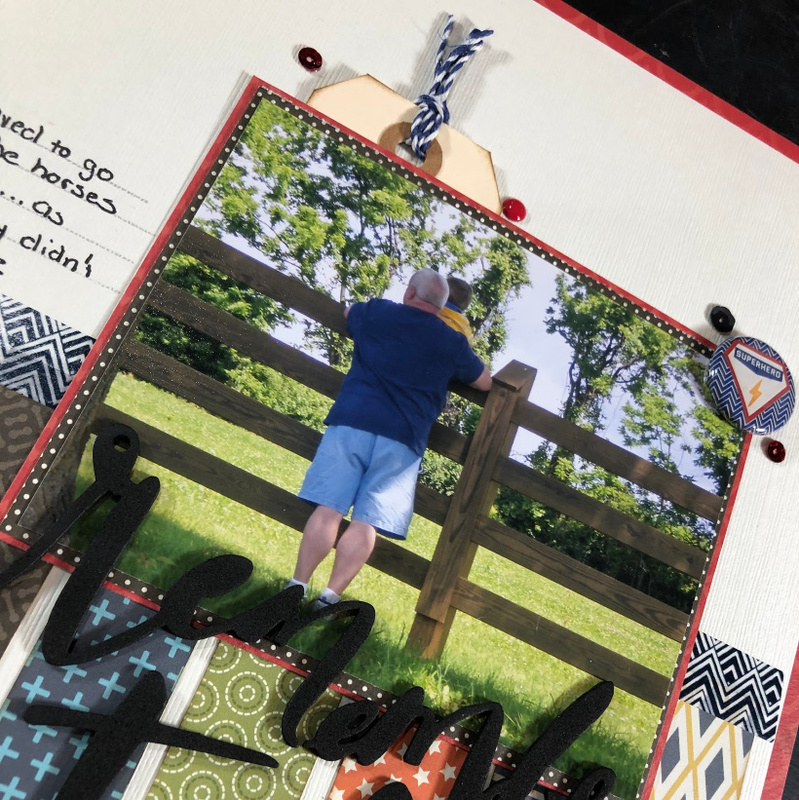 We were challenged to do something with animals so I created this grandfather and grandson layout of them watching the horses. Far fetched I know! When our son was little my parents watched him two days a week. He loved animals and diggers…what boy doesn’t right!? When the weather was nice they went to local construction sites to watch the diggers and also local arms to watch the animals and horses. My mom captured this photo and I wanted our son to have it documented since his grandparents are so special to him. The paper is a VERY old collection from Carta Bellas called Boy Oh Boy. I’ve been trying to kill this collection for years and I think I may actually still have bits and pieces laying around. This layout was done with the 6×6 paper pad though. I keep looking for ways to use all the 6×6 pads I have up, and I’m still not making a dent. Do you have any tips? Thank you for checking out my share today, and I hope you’ll pop over to Southern Girls and check our what the rest of the girls created. As always, if you participate please remember to leave me a link so I can be sure to check it out. Also, leave me your 6×6 pad paper tips below too! Until next time…stay crafty! Hey crafty friends! 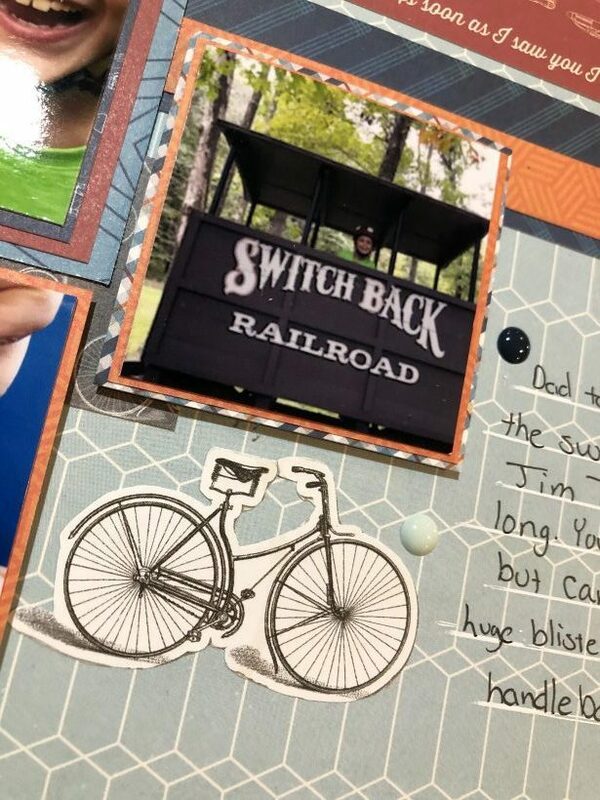 Thanks for joining me today as I share this Father Son Bike Trip Scrapbook Layout. I was inspired by one of the case files over at Color, Stories, Inspiration. 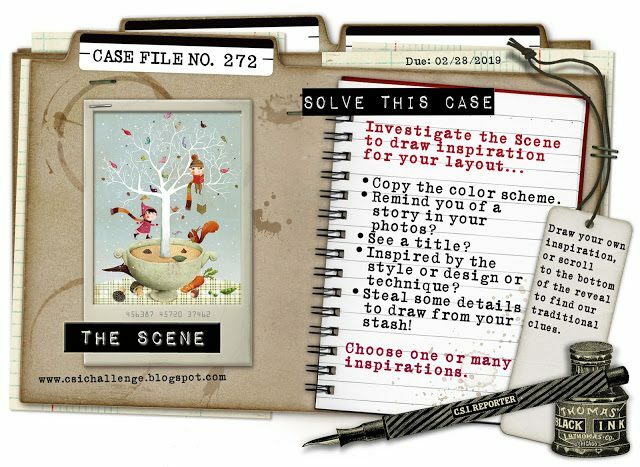 They have three pieces to use as inspiration, but the one that really struck me right away was case file 272. The first thing that jumped out at me about the case was the children, or they could be elves, were outside playing in the tree with birds and squirrels. 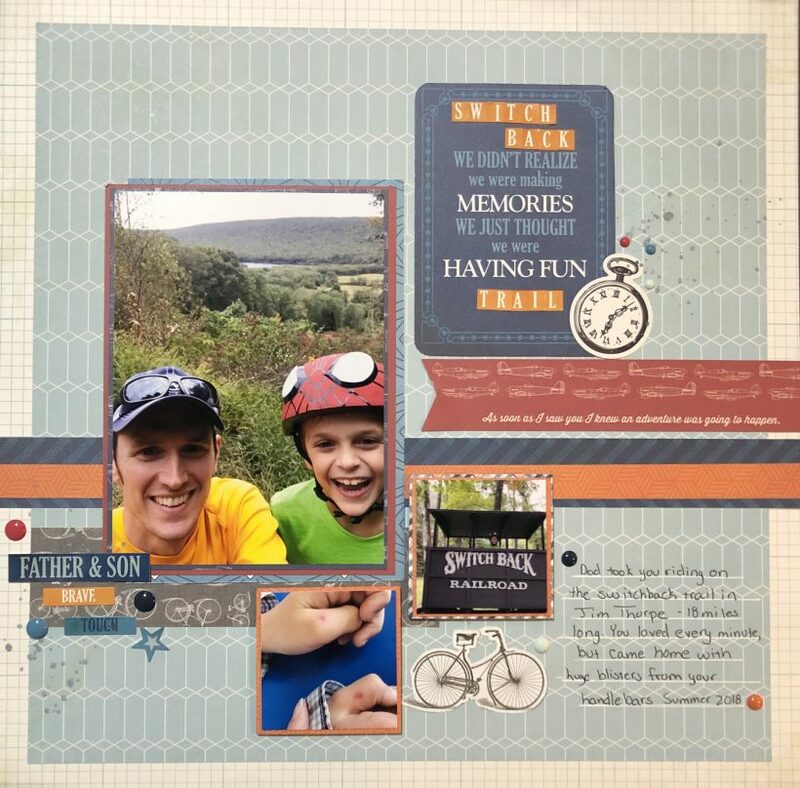 I had photos of my husband and son out enjoying nature on an 18 mile bike ride. Totally fits right!? The light background of the inspiration scene also provided inspiration for the background paper I chose to use. I don’t usually use patterned paper for my background, but this one wasn’t so overwhelming that I thought I could work with it. There was also paper with bicycles on it, and since this was a bike trip, that obviously had to go on the page as well. There was also one bicycle sticker on the sticker sheet, but can I tell you how huge it was! This was one of those collections where all the ephemera was just so large. My solution was to cut the bicycle off the front sheet where it shows you all the paper partners in the kit. It was just the perfect size! The large photo on the page is 4 but about 5.5. The two smaller photos are 2×2 made using the collage function in picmonkey. With the college function I can print six 2×2 photos on one 4×6 paper. I’ll plan two pages that have small photos and print one 4×6…saves my photo paper and ink that way. Thanks for sticking with me as I explained this page. I hope to do at least one more of the case files this month so keep a look out for that. In the mean time….stay crafty! Hey crafty friends! Welcome to my last Southern Girls Challenge…for this year. Don’t worry, I’m not leaving! For Team Lou’s challenge this go round we were given free rein. That’s right…anything goes! Since I have been working on killing some of my older kits. 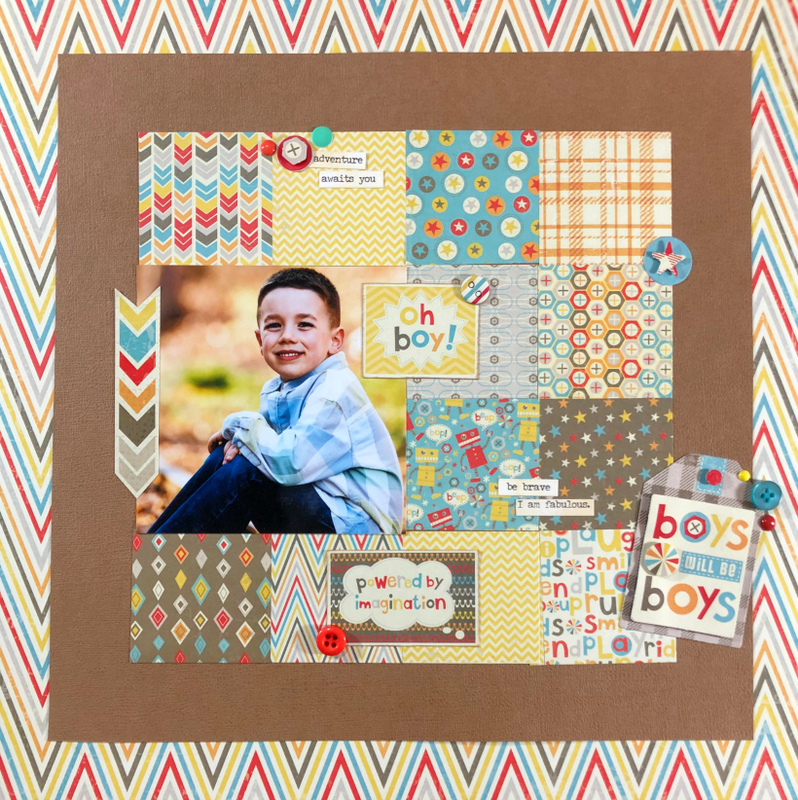 I created this school age boy scrapbook layout featuring my nephew. 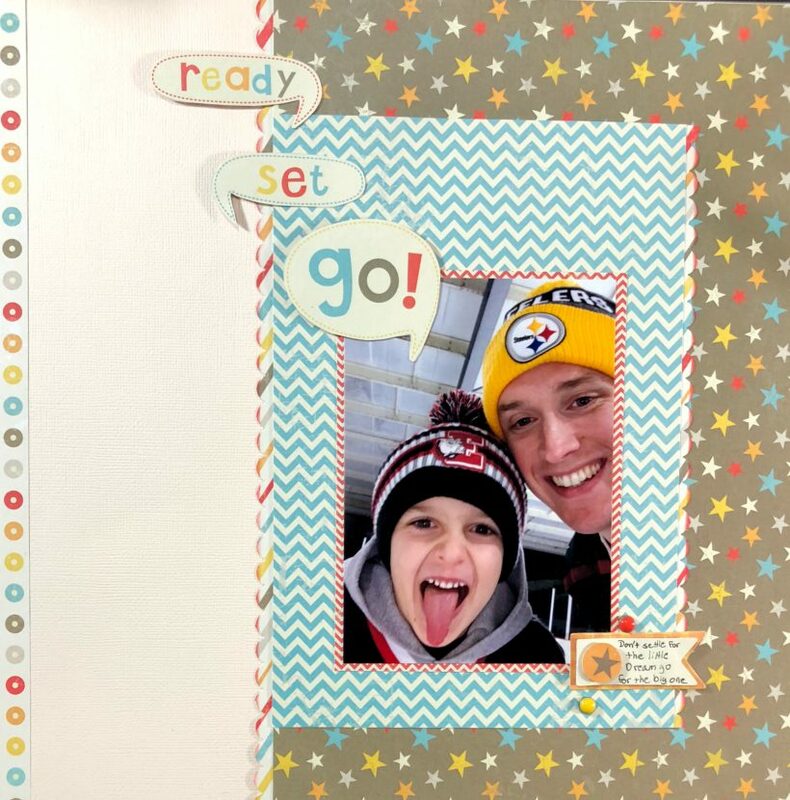 The layout features 2×2 squares as I had a lot of the 6×6 paper pad left when I was creating this. I also liked the smaller size for this. Since there were so many different pattern in one area the smaller scale of the 6×6 helped them not overwhelm each other. 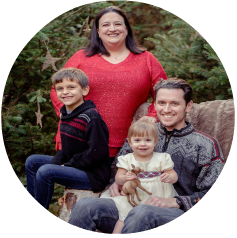 Then to make my nephew’s photo still the focus I made his 4×4. It still fit the grid, but since it took of two of the squares it’s the focus. 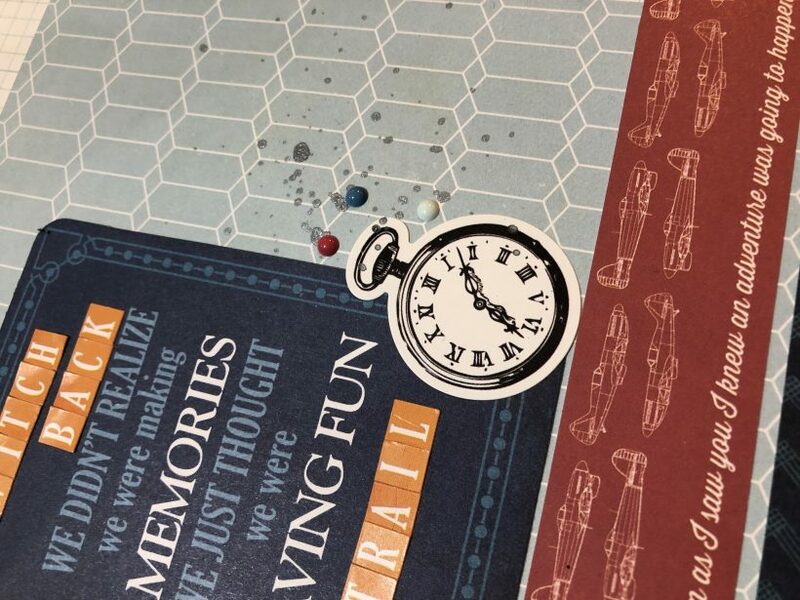 To add interest I just used some of the stickers and dimensional items from the kit. 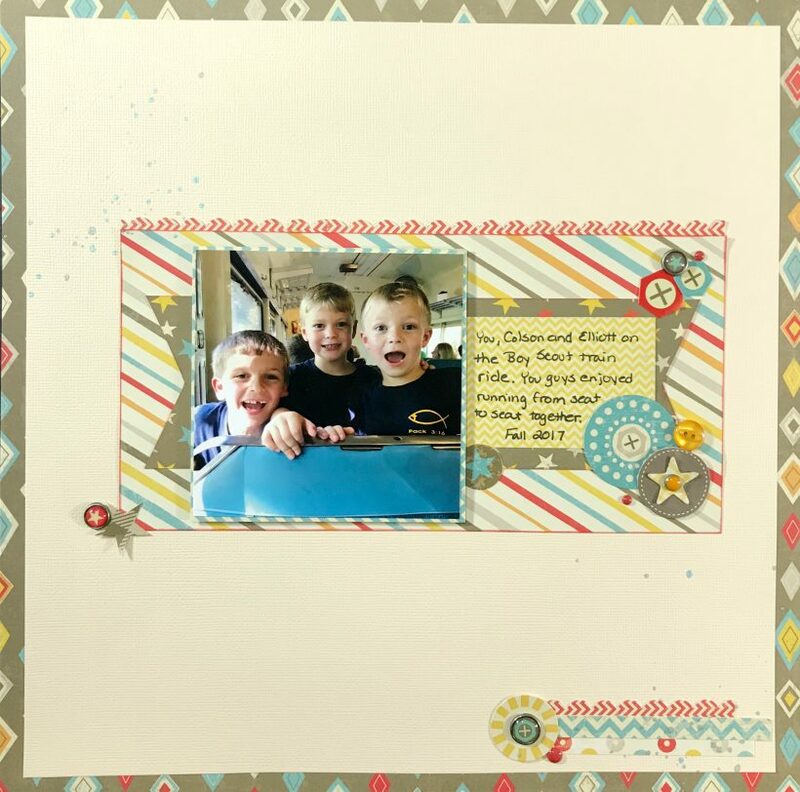 This is another layout for my SIL so I hope she loves it at much as I do. I’ll be back in December with projects for other teams so keep checking back for new inspiration. Also, be sure to head over to Southern Girls to check out what the other ladies created, and to enter your creations. Until next time…stay crafty!! !